Korea's Swing Guitar Technology is a serious up & comer. The "Hybrid" here (click image for full specs and more pics), sports an Alder body, Gotoh bridge w/titanium saddles, Grover tuners, OAK switches, Graph-Tech Nu-Bone nut and cloth covered vintage style wiring. 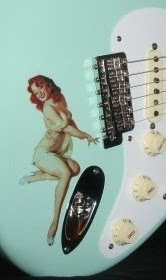 The pickups, made by Swing, include a PAF style at the bridge. The Swing website is pretty substantial. They have a custom shop and their own artist models. One of their artists, Tommy Kim, does a mean Robben Ford in demonstrating the Hybrid in this VIDEO. As you tour the Swing website, be sure also to check their Dealer link. Although they currently show only a rep. for the US market, they have an extensive international outreach, and have been a NAMM member-exhibitor for at least 3 years. Swing's latest "Prism" model, featured in GP & GW, incorporates an LR Baggs system and a number of innovations. So watch out for these guys! !